"The dwarf had been whetting the edge of his axe and making some mordant jest when Bronn spotted the banner the riders carried before them, the moon-and-falcon of House Arryn, sky-blue and white. Catelyn had never seen a more welcome sight." I made this Vale-themed entree for my Game of Thrones Season 7 Party. For each course, I tried to craft a dish that both visually and thematically represented one of the Great Houses of Westeros. 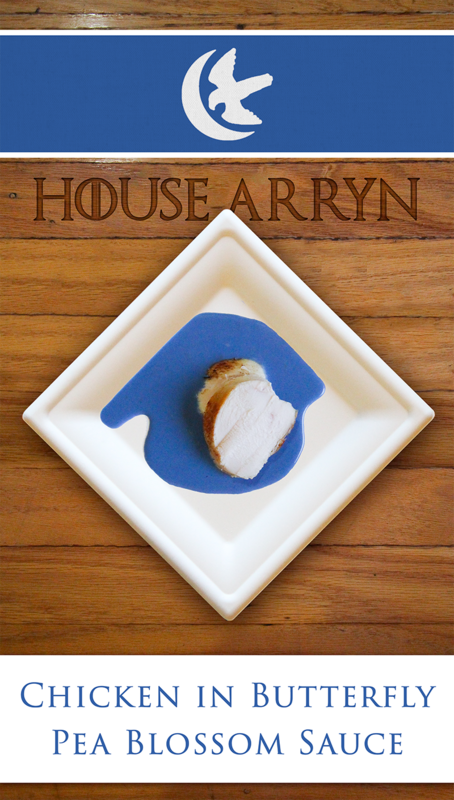 House Arryn was one of the more challenging sigils to translate into something edible. Blue is not a color you eat often (although I've cooked blue food a remarkable number of times). I considered doing something like a blueberry cheese cake, but even blueberries are more purple than blue. I wanted to incorporate the falcon imagery into the dish too, which suggested some sort of fowl course. My mindless browsing of reddit's mead forum fortuitously showed me the power of butterfly pea blossoms, which mead makers use to naturally dye their brews a beautiful bright blue. I played around with it for a bit to figure out the best way to incorporate this into a savory sauce. The color is strong, but pH sensitive - acid like lemon juice will turn the dye purple. Mixing the tea from the flowers into an opaque white medium helps make the vibrant color more apparent. A cream sauce seemed like a good starting point. I tried making a mushroom cream sauce, but the grey of the mushroom muddied the sky blue of the blossoms to produce a rather unappetizing indigo mess. I concluded I needed an even whiter base sauce. I decided to go with a roasted garlic sauce. The blossoms themselves have a very mild vegetable flavor, so roasted garlic rounds out the sauce nicely by packing a lot of flavor without changing the color much. I added in a roux to thicken the roasted garlic and cream sauce. The result was very tasty, and, importantly, very blue. For the falcon part of the sigil, I went with chicken. Because I was prepping and serving nine different courses at my Game of Thrones dinner party, I wanted a way of cooking the chicken that required the least possible oven space and monitoring. I therefore chose to sous-vide the chicken, and quickly browned the chicken in a skillet before serving. The sauce can easily be adapted for whatever method of cooking chicken you like best, or even alternative protein sources! I had a few vegetarian guests over, and I served the sauce with cloud eggs. Eggs match the avian theme of the Arryn sigil, while clouds are a nod towards the Eyrie's high perch. Serves 4 full-sized portions, or 12 tapas-sized portions. Preheat oven to 450°F. Line a baking sheet with parchment paper or aluminum foil. Peel off excess layers of the garlic skin, keeping the head attached. Slice off the tops of the cloves to expose the garlic inside. Put the garlic on the prepared baking sheet. Drizzle each head with the vegetable oil. Bake the garlic for 30 minutes or until the cloves become very soft. Allow to cool. Remove the garlic flesh and crush into a paste. Fish out any very brown pieces. Store in the fridge until you are close to serving. Steep the dried butterfly pea blossoms in the water for five minutes. The water will turn an inky dark blue. Discard the blossoms. Melt the butter in a small saucepan over medium heat. Sprinkle the flour on top, and stir in to combine. Let the roux cook for a minute, but do not allow it to brown. Whisk in the cream and bring it to a simmer, then turn off the heat. A tablespoon at a time, stir in the butterfly pea blossom tea until you achieve the desired shade of blue. Season with salt to taste. Spread a spoonful of sauce on a plate and top with sliced chicken. If brining the chicken, dissolve the sugar and salt in the quart of water. Let the chicken soak in the brine for at least an hour, or overnight in the fridge. Set the sous-vide to 145°F/60°C. Seal the chicken breasts in plastic bags and cook for 1.5 - 4 hours. When ready to brown the chicken, remove the chicken from the sous-vide and pat dry. Heat 1 tbsp vegetable oil in a large skillet over high heat. Working two chicken breasts at a time, brown each side of the meat until golden - about 2 minutes per side. If necessary add more oil to the pan for the second batch of chicken. Let the meat rest for a couple minutes, then slice. 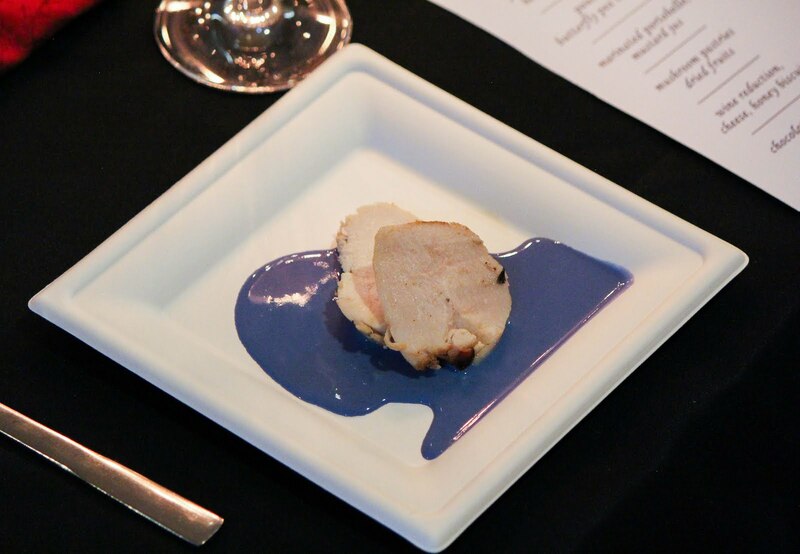 Serve with butterfly pea blossom sauce.